The Haunted Bookshop by Christopher Morley. Recommended by a friend. Frankenstein by Mary Shelley. Because I have never read it. I know, shame on me. Dracula by Bram Stoker. Again, one I have never read. I plan to listen to this one. The Legend of Sleepy Hollow by Washington Irving. Another new one that I plan to listen to. Oh and The Sword of Summer, the new Magnus Chase book by Rick Riordan. Because I wait all year long for his books to come out. I don't care if it's Halloween-y or not. I will read it as soon as I can get it and you can't stop me! The Graveyard Book by Neil Gaiman. 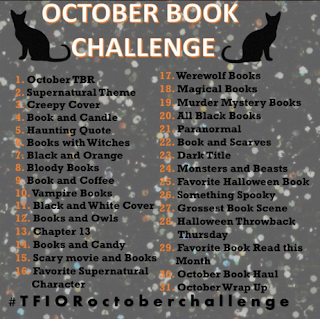 I always read this one in October, but I may not get to it this year with my other planned reads. M is for Magic by Neil Gaiman. This is a collection of stories I stumbled across more than a year ago and haven't read yet. I have it as an audiobook and will read it if I finish my others in time. And, if time allows, The Diviners by Libba Bray. New one that I have seen recommended by a couple of book blogs I follow. It sounds spooky, but not scary. Right up my alley. It started to turn into a list of classics because last year I realized how few of these I had read. It's about time I fixed that. If you would like to follow my progress, do so via my Instagram or my Tumblr. Anyone else have spooky reads this year?